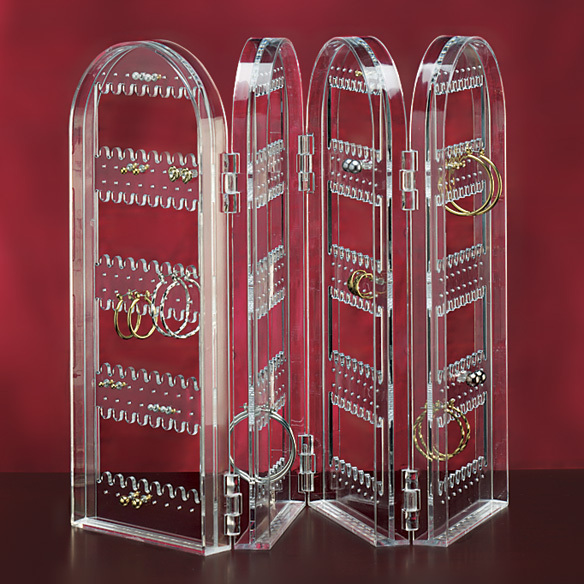 Earring holder has four crystal-clear panels that hold up to 128 pair of pierced, screw-back, and clip-on earrings, each instantly visible and accessible. Earring rack panels fold out to stand on your countertop, collapse down to tuck compactly away. Acrylic. Earring stand open: 17" long x 10 3/4" high. Collapses to 4" long x 10 3/4" high. My friend saw one of these and wanted one for Christmas. Good design. Easy access. Efficient use of space. Good price. BEST ANSWER: Thank you for your question. No, but the unused panels can be folded up. We hope this information will be of help to you.